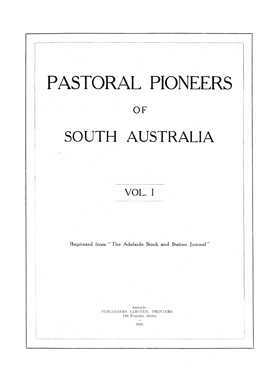 Compiled over a number of years, the 'Pastoral Pioneers of South Australia' (R. Cockburn. 1925) is a compilation of articles that were first produced by The Adelaide Stock and Station Journal as series of biographical sketches from 1923 to 1927. This two volume set contains approximately 300 biographies of South Australia's Pastoral Pioneers and Old Colonists. The Foreword claims that '... this is the most comprehensive collection of biographies ever produced in relation to the pastoral industry of any state'. A photograph accompanies each entry, as well as extensive biographical details. This publication follows the guideline of regarding persons who arrived in South Australia prior to December 28, 1846 (the tenth anniversary of the proclamation of the Province) as "Pioneers", while those who arrived subsequently to that date and prior to December 28, 1856, were termed "Old Colonists". A large percentage of the entries in these volumes contain previously unpublished information. Much of this was supplied by descendants and old friends of those listed, including details and stories that would have otherwise gone unknown. This is a significant record of the early pioneers and pastoralists who helped make South Australia what it is today. It's an invaluable genealogy tool for anyone searching their family history or building a family tree.